published in the July/August 2015 issue of Westlake Malibu Lifestyle magazine. She sits at the northwest corner of the world’s second largest continent, and is home to a place of extraordinary diversity – from the land to the people. The country of Morocco is just 7.7 nautical miles away from Spain, its closest European neighbor, but stands worlds apart. The culture is as rich as the spice that infuses the food, and the terrain as varied as the oceans, deserts and mountains that fill the landscape. Together they weave to form a deliciously exotic tapestry that will fill your senses to their capacity, yet will leave you wanting more. Fes is a UNESCO World Heritage Site and appears to be a land trapped in time. Visitors step back centuries into this medieval world, whose cobbled streets are filled with ancient mosques, towering green-glazed minarets and crumbling fondouks (hostels for travelers and their animals). Narrow doorways peer into private worlds, revealing peaceful courtyards filled with carved cedar, brilliantly colored mosaic tiles and delicately carved stucco ornament. In Fes, veiled women hurry through the winding streets, while donkeys, laden with their wares, take their time. Proud artisans handcraft relics much as their forefathers did centuries ago. It has been said it’s about the journey, not the destination. When your destination is literally near Timbuktu you might be surprised to find that the journey is scenic and rich in history, rather than a barren road leading to nowhere. The trek from Fes to the Sahara included driving south through the cedar forests of the Atlas Mountains until the road eventually turned to sand and the Town & Country group found themselves in the midst of ever changing red sand dunes. 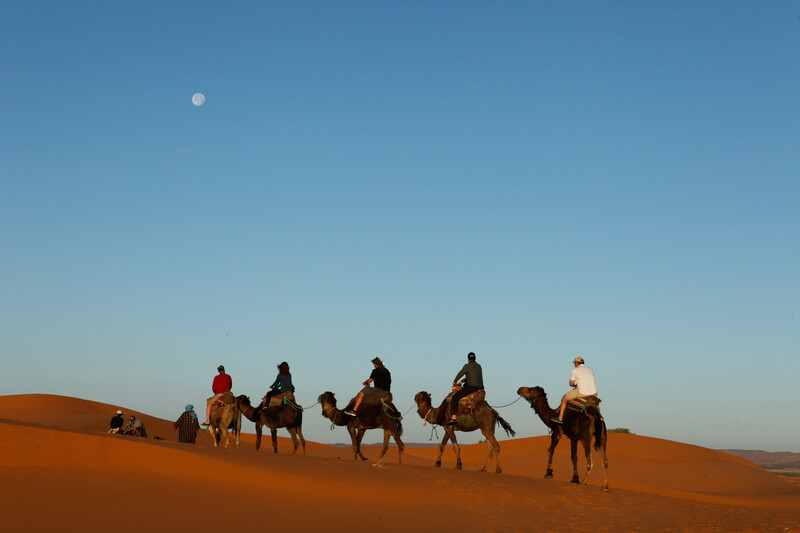 The Tafilet Oasis is the stage for quintessential Moroccan adventure. Stunning, dramatic and simply breathtaking. The cascading sand dunes are a playground for adventure seekers, yet equally offer the opportunity for ruggedness and opulence. “Our 4×4 Land Rovers slithered their way to our private Bedouin tent desert encampment, where we stayed for one spectacular night under the full moon. 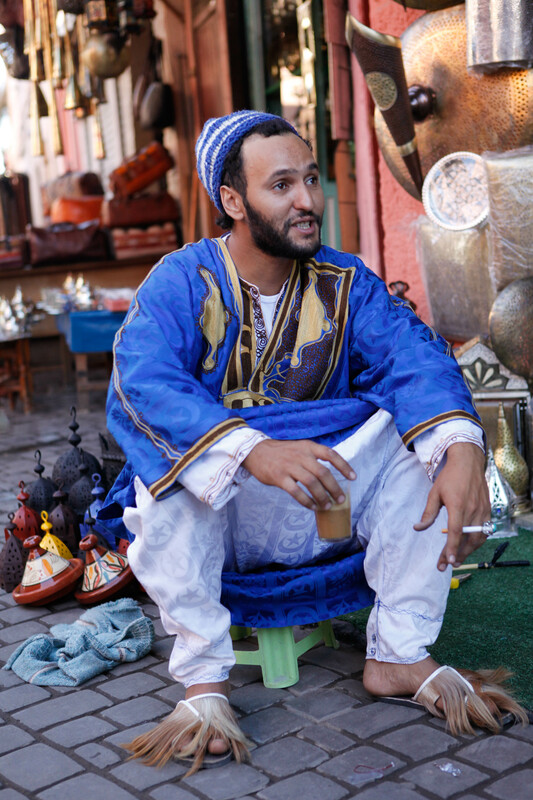 The group adorned their recently acquired Moroccan attire,” said Winter. A lazy line of camels greeted the group upon arrival and trekked them up the dune just in time to watch the setting sun turn the sweeping desert sands from orange to gold. And again at sunrise. Dramatically set between the Atlas Mountains and the Sahara Desert with the rugged hills of the Skoura Oasis as the backdrop, you find the Dar Ahlam boutique hotel. 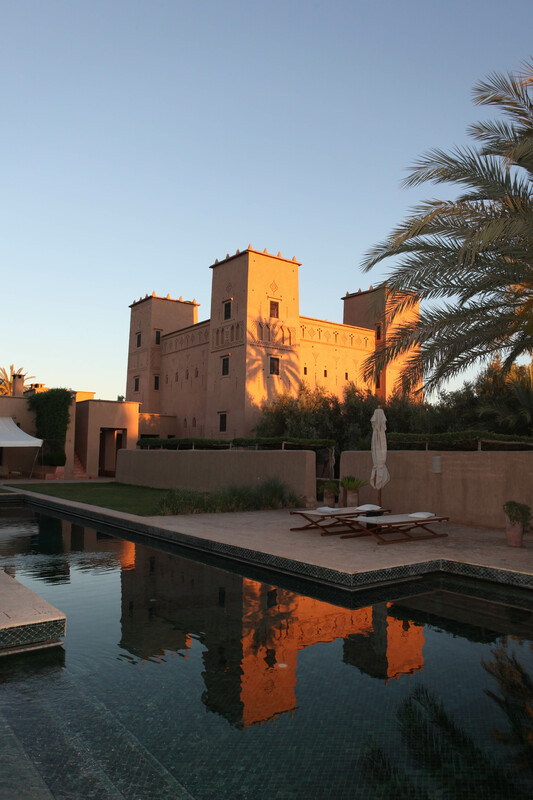 This Relais & Chateaux property is a renovated 19th-century Kasbah whose name means ‘House of Dreams,’ and every effort is made to live up to the namesake. Meals are an enchanting daily surprise. Tables are set up in different locations depending on the day’s theme. 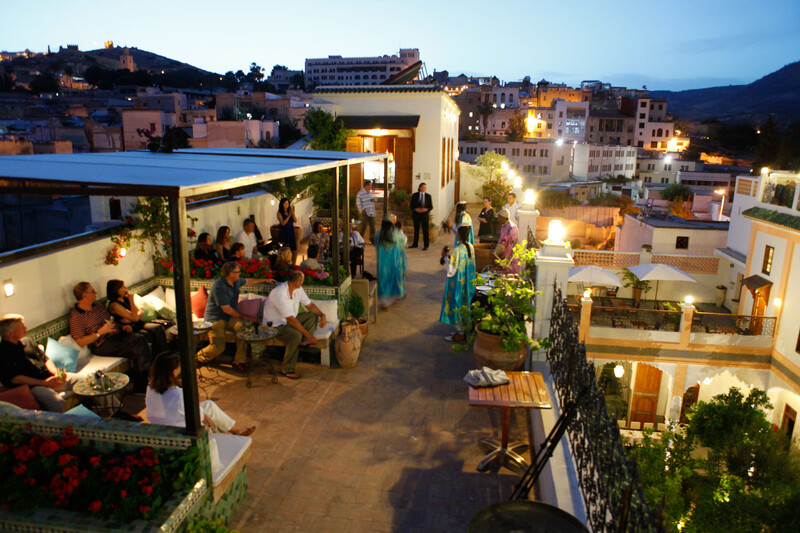 Lunch may be in the herb garden or an olive grove, then dinner in a cozy lantern lit corner of the Kasbah or on a secret terrace. The 2 days spent here were committed to relaxing by the sleek outdoor pool and exploring the terrain that was the setting for dozens of movies from Gladiator to Lawrence of Arabia. 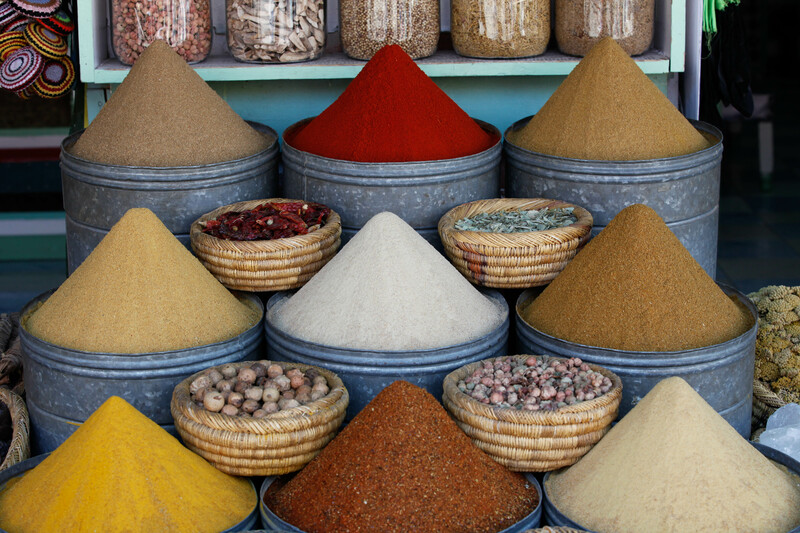 From the food to the setting at the Dar Ahlam, the indulgence in Moroccan delicacies kept the senses dancing. And for the final act: Marrakech. With the design flair of Paris, the ethnic diversity of New York, the commercial heartbeat of Hong Kong, and a history to rival any city in Europe, Marrakech is now recognized as one of the world’s great cities. The focal point was on the frenetic Djemaa el Fnaa, the greatest square in all of Africa, and perhaps the world. The square starts to really come alive at sundown with a dizzying array of storytellers, healers, snake charmers, and countless food stalls. A walk through the square to experience its intensity is essential, and then cocktails and a meal from the terrace of a rooftop café is a welcome reprieve from the enterprise below. 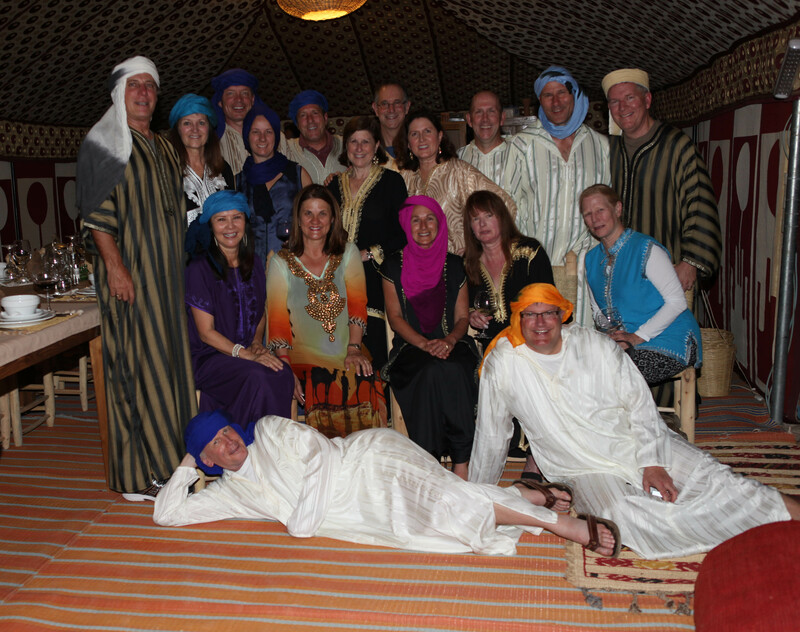 For the final day in Morocco, each member of the group was offered an optional activity: cooking class, golf outing, pottery making, photography class or additional sightseeing. If you crave exotic luxury travel, this is the ticket. A private raging dinner party below a full moon and between the cascading sands of the Sahara, is just one of the many over-the-top memories these travelers brought home. A local saying says, “It’s better to have honey on your tongue than money in your pocket.” Experiences are always worth it. Perhaps you’d like a taste? Contact Town & Country Travel at (805) 495-9888 or visit our website at www.countrytravel.com to plan your next dream vacation. 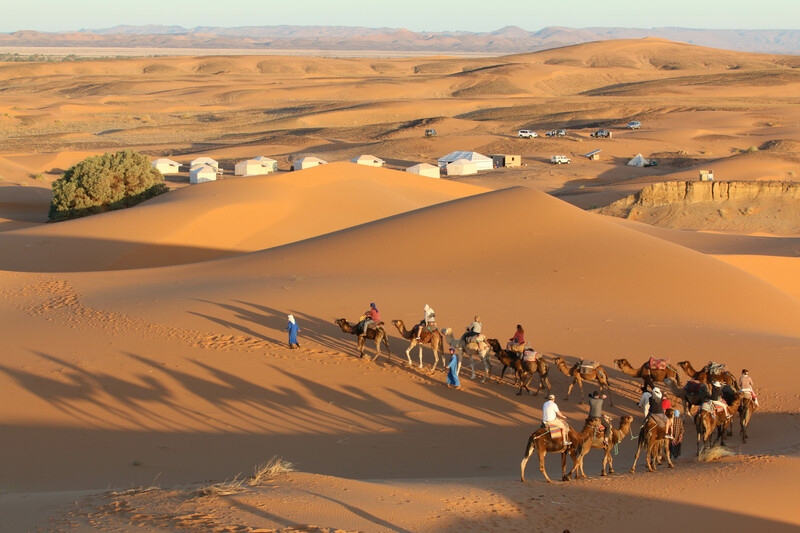 This entry was posted on June 1, 2015 by townandcountrytravel in Recent Journeys, Trips Worth Doing and tagged camel trek, fes, kasbah, luxury group tour, luxury travel, marrakech, morocco, Relais & Chateaux, sahara desert, town & country travel, travel agency thousand oaks ca.